So you fancy relaxing in the sun and checking out the Madrid golf scene? Golf is an excellent way to get out of the hustle and bustle of the city centre and to see some of Spains countryside at the same time! Whilst most people in search of holiday golf head down to the Mediteranean coast or Portugal to play Madrid can offer golf courses that are just as good coupled with the benefits of a major city. 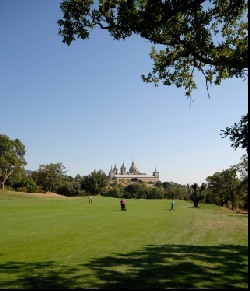 Madrid golf courses are one of the, up until now, undiscovered gems of Spanish golf. "Hola, soy ingles. Hay algien ahi que habla ingles?". You have just asked for someone who speaks English and normally there will be someone with you shortly. Note: Some Madrid golf courses will require that you pay a temporary membership fee or have restricted entry. Don Francisco Javier Cubillo Alonso Esteña, S.L. 9 holes - Rough is .... Very Rough! 18 Holes, Part of a larger club, One of the best in Spain - You may have trouble getting in. 9 holes - Not very challenging for the advanced player. 9 Holes, Begineer / Learner course. 18 holes - Challenging for all abilities. 9 holes - all abilities. 18 Holes - top quality course. Madrid-Burgos road, km 8.5. In La Moraleja. 18 Holes - handicapped players. Ctra. de Robledo de Chavela, s/n. 9 holes Begineer / Learner. Non-members restricted to Tuesday to Friday. For details on how to get to the Madrid golf trade fair see here!